If you’re a thought leader in your sector, chances are you receive regular invitations to complete surveys, participate in interviews and focus groups. There’s a lot of consultation going on… but when it comes to scanning the external environment, many non-profit organizations need and seek the same kind of information. 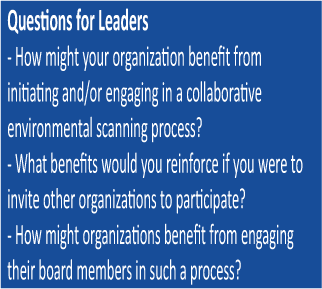 There’s no doubt that understanding what’s going on in the environment is an important aspect of strategic planning; but is there a better way for stakeholders to understand the system they operate in? Individual agencies generally analyze external forces through internal discussions about their findings. 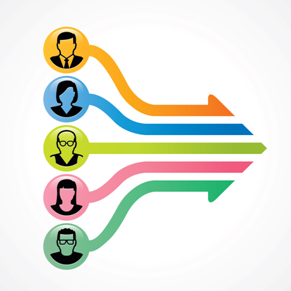 How can we break out of these agency silos to better understand the rest of the system? In our consulting practice, we assist organizations in scanning their internal and external environments as part of a strategic planning process. This common quest for data and system understanding represents an opportunity for organizations to get smarter together. 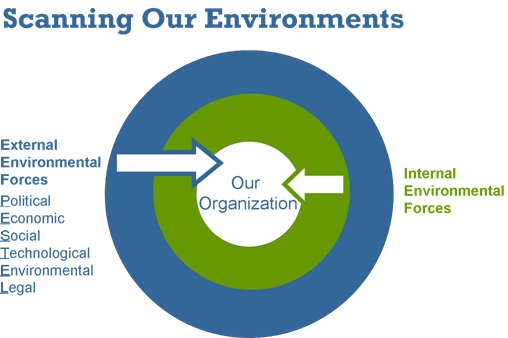 Many PESTEL (see diagram above) forces in the external environment affect every non-profit organization to some degree, while some impact only those working in a particular sector, or with a particular population. Historically, and with permission, we’ve shared such findings across agencies working in the same sector. Recently we experienced a more efficient and effective approach. In the fall of 2013 we facilitated an environmental scanning process for 21 Toronto area supportive housing agencies. The process was collaborative, efficient and led to the identification of four areas of collective action for their 29 member Network – the Toronto Mental Health and Addictions Supportive Housing Network (the Network). Network members have a long history of working on collaborative initiatives; this process gave them an opportunity to share knowledge and collectively make sense of their common challenges and opportunities within a shared and evolving system. The supportive housing sector receives funding from a variety of sources and staying up-to-date with funders’ changing expectations, along with the changing needs of tenants/clients and staff requires significant effort. It’s almost impossible for any one leader or organization to stay on top of all the trends, forces and new research, even if leaders are involved in sector initiatives and diligently scan the external environment on an ongoing basis. As part of the scanning process, we surveyed Network members, consumer groups, funders, and private landlords to learn more about their perspectives on the supportive housing system and the changing needs of tenants/clients. The sector scan process benefitted from the knowledge and insights of the 21 partner agencies and their Executive Directors (ED). EDs shared key reports and recent research that has informed their organization’s work. These documents were posted to an online repository that all partners can access at their convenience. We analyzed the content of the reports and survey data, and distilled the findings in an Environmental Scan Report. Partner agency representatives met for a half-day strategic thinking session to explore the findings presented in the Report. Participants added to, and challenged some of the findings, and discussed the implications for the supportive housing sector and those they support. The discussion concluded with the identification of four areas for collective action. Leads for each area agreed to convene action groups to move the four initiatives forward. At the strategic thinking session participants commented that the collaborative process helped the group focus on the system as a whole. 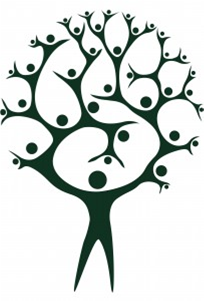 The collective action will reinvigorate the Network by giving it new direction. The Report will be of interest within and beyond each organization. Elements will be shared with a variety of external audiences. Ideally the Scan will serve as a common platform for supportive housing agency strategic planning processes and lead to an ongoing exchange of information and dialogue among Network members. Participants thought an annual strategic thinking session for the Network would be valuable. We were thrilled to be part of the process and would like to thank the Project Oversight Group members that we collaborated with to co-design and implement the process. We think the process will enhance the supportive housing sector’s ability to respond collectively and creatively to the forces driving change and ultimately deliver better outcomes for those they support. It significantly reduced duplication of effort – for agencies and those consulted. Although we recognize this process benefitted from the Network’s historical working relationships, we think it could be replicated in other sectors with less developed collaborative relationships or networks. It’s an ideal way to experiment with collaboration and build trust within a sector. Operating in a Systems World – What’s a Board to Do? O Leader, where art thou?